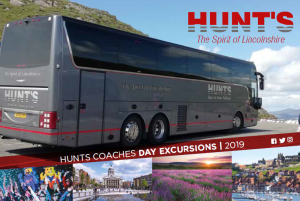 Hunt’s Coaches Day Excursion Brochure 2019 is packed with more trips than ever for your pleasure and enjoyment. We have some fantastic last minute coach holidays across the UK planned too. The brochure includes some fantastic concert and theatre trips to keep you fully entertained. One night breaks proved popular last year and we have added more of these to the back of the brochure. There are regular customer favourites such as York, Whitby and Thursford Christmas Concert trips. Of course we have some fabulous special offers too, keep a look out for those £10 offers. Local pick-up locations include Burgh le Marsh, Skegness, Ingoldmells, Chapel St Leonards, Alford, Spilsby, Louth, Horncastle, Boston and Grimsby.